Have you been thinking about going on a road trip with your dogs but haven’t made the commitment yet? This level of exploration together can be fun for both of you, but before you head out with the Maltese puppies for sale that you purchased from us, take a look at these dog care tips. There are tons of options for you to keep your dogs safe while riding in the car with your. Maltese puppies get older but they don’t grow too large, so you want to make sure that they’re fully protected in a vehicle! Here are some items you can purchase that can secure them. What are seat belts important? To non-pet owners or new ones, it may seem weird to have a seat belt for your dog, but it’s done out of love and protection. 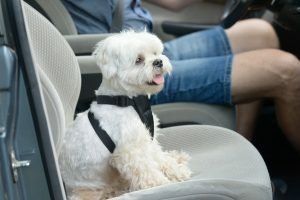 When traveling by car with your Maltese puppies, a seat belt or harness will be imperative. They will help keep your precious dogs safe if you have to make a sudden stop. Keeping them secure is also a great way to keep them from distracting you while you’re driving, after all you want all of you to arrive safely so strap them in! What about feeding your pups on the road? You want to make sure that you’re timing your feeding. This is the absolute best way to help prevent motion sickness in your dogs. Sometimes a full stomach for humans is difficult to handle on the road so the same goes for dogs. Try not to feed them no more than 2 hours before you get on the road, for long trips. Traveling with your dog can be such a fun and rewarding experience and the destination will be even better!